Credit Canada has an online calculator that is really quite a good way to start learning about managing money. It is human nature to avoid knowing what we don’t like to know, especially the balance in our bank account. Talk to 10 people on the street and most of them will probably not know how much they have in their account, living in denial of their ever shrinking funds. Those who do readily know where their account sits are probably very diligent at managing their money. So I challenge you to visit Credit Canada and fill out this budget form. Another observation is that men are more reluctant to talk about money issues. So, I would challenge the male readers to answer these questions. Growing up, how did your parents manage money? What kind of financial situation did you grow up in? Low income? Middle class? Wealthy? How does it affect your attitude towards money and finances today? What do you consider to be success with money? Do you keep track of your financial situation? How do you feel about your financial situation? These questions are the most important first step to becoming a good money manager. If you don’t care, then nothing happens. No news there. However, the fact that you are reading this suggests you care on some level and want to learn something. So, here are some tips for couples. Establish both separate and joint accounts. Agree to the minimum that each one puts into the account every month. The smarter move would be to create a joint savings account, like a Mom Matched Savings Account with Cashco Financial that matches a specified amount of monthly savings. Do not share credit cards. Credit Canada has an online calculator that is a good way to start learning about managing money. Managing money is not just an accounting process. It’s also about psychology. Credit Canada has several tools to educate individuals and couples around money management. Their workbook walks you through many questions including some that explore attitudes and emotions. 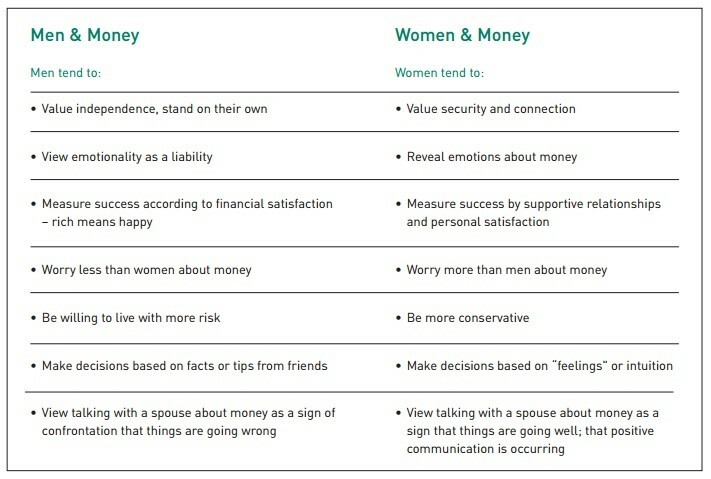 One key observation as it relates to relationships between men and women is that women worry more about money than men. Set up a regularly scheduled, monthly, couples’ meeting to discuss finances and review bank statements together. Stick to the hard facts. Avoid comparisons to how parents managed money or point a finger is there if an issue. Discuss solutions to issues. If emotions are starting to get in the way, take a break. Reschedule the meeting if it will help. Establish common goals and celebrate successes along the way to achieving that goal. It might help to break up financial responsibilities. For example, one of you might focus on general expenses while the other focuses on utilities. Perhaps switch it up from time to time so that, as a couple, you develop a full appreciation for how you’re spending and saving money. As you begin the process, work toward building a budget that makes sense for both of you. Discuss wants and needs. Examine your lifestyle and make small, step by step decisions to cut costs. For example, if you tend to eat out frequently, reduce your restaurant visits by a third in the first month and work on a goal to reduce it by half over time. If you notice that certain behaviors in our life lead to costs that are more than they should be, such as phone usage, then, like you did with dining out expenses, start reducing your usage a little at a time. Pro-rate the amount of money each one contributes based on a fair assessment of income. If one person makes substantially more than the other, then consider adjustments to how much each of you covers in terms of bigger expenses like rent. Basic utilities and groceries can be shared equally or the adjustment can be smaller. Examine your lifestyle and make small, step by step decisions to cut costs. Most couples are uncomfortable with the notion of sharing the household finances because of the risk of conflict. Consider the flip side. Two incomes present a significant opportunity. First and foremost, understand each other. Learn about each other’s attitudes towards money and where it comes from. Lastly. Take small steps. Rome wasn’t built in a day.